Planning A Private Party In Philly? Check Out Wax + Wine! Last week my friends and I booked a private party with Wax + Wine to celebrate the birthday of our good friend, Marie-Elena. For those of you who are unfamiliar with Wax + Wine, it's a candle bar located in downtown Philadelphia, where you can create your very own candle while enjoying BOY wine. Upon arrival, Jordan, the owner of Wax + Wine, escorted us to the private room and introduced us to the process of candle making. Jordan and his co-worker Robby were both charismatic and welcoming, which set the tone for a lovely night! During Jordan's informative introduction, we enjoyed the wine and snacks that we had brought with us. After getting settled, we spent some time in the "cellar," smelling and picking out our favorite scents. This was by far my favorite part! My friends and I all helped each other decide on the best combinations of scents for each of our candles. We then picked out our containers and made our way back to the private room to start our creations. We stirred our scents together and took turns measuring/pouring the hot wax. While we waited for Jordan to cool our candles, the girls and I explored their products in the main room and continued drinking our wine. After some time, we made our way back to the back room so that we could sing Marie-Elena Happy Birthday and enjoy some decadent cake. Once our candles were ready, Jordan and Robby packaged them up in boxes/gift bags. And before we left, Jordan gave us a chance to win some free products via a trivia game. He also generously provided a free gift to the birthday girl! By the end, we all walked away with two beautiful candles, knowledge of the candle making process, full stomachs, and a memorable experience. Everyone agreed that it was even more fun than we had expected! If you're interested in booking a private event, simply visit the "Contact Us" page on the Wax + Wine website to get in touch with one of their event coordinators. 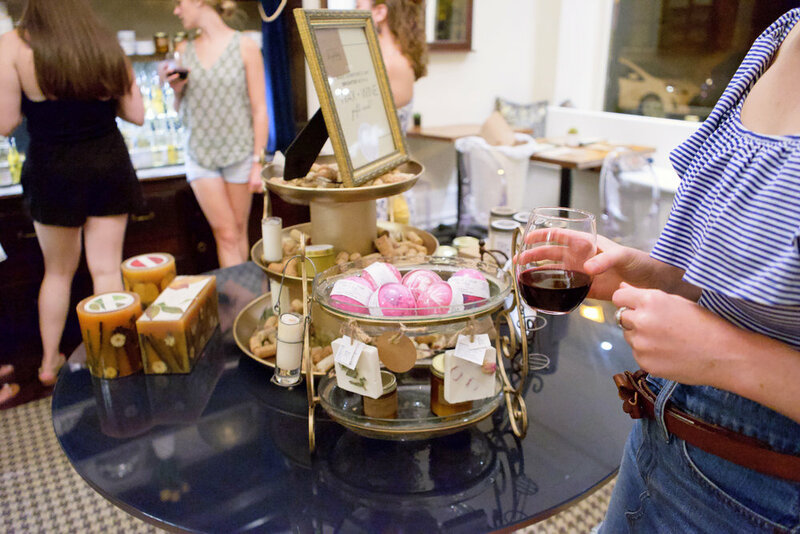 By the way, Wax + Wine is not just for private events -- make a reservation with a friend or two for a fun night out, or come by yourself and make a candle as a gift for someone. They offer three different packages to choose from which you can find by clicking here! P.S. I'd like to give a huge shout out to my friends for letting me photograph them for this blog post. Love you guys!